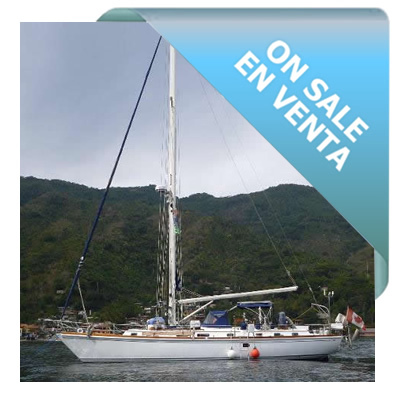 If you are looking for top shelf quality, performance and luxury don't miss out on this impressive yacht. The engine is a 2009 4JH4-TE Yanmar diesel with 1005.5 hours and two hours since her last full service. The motor propels the boat 6 knots at 2200 RPM with a maximum speed of 8 knots at 3000 RPM. This yacht uses one gallon per hour at cruising speed and 1.8 gallons per hour at top speed. Engine access is excellent from all sides. There is new soundproofing in the engine room as well as dedicated lights for ease of maintenance for engine, transmission and generator. 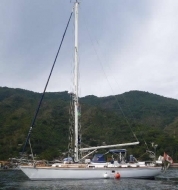 With her 130 gallon fuel tank this Yacht has a cruising range of 700 miles under motor alone. 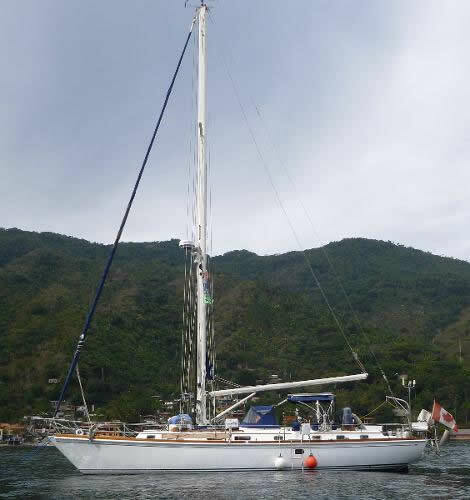 The galley is located to starboard of the companionway. It succeeds in combining lots of accessible counter space while still providing the cook with the security of a compact U shaped cook station. Since the galley faces the great saloon there is no sense of being cramped, just secure. 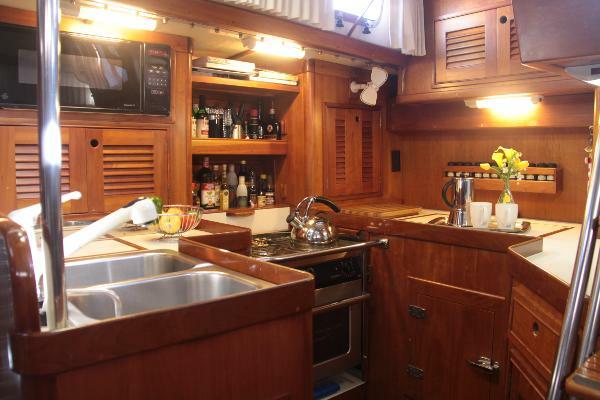 The cook is also close to the companionway for ease of passing meals or snacks to the cockpit. The owners installed a Grunert 120 V refrigerator with top and bottom door access. There is also a large Grunert 120 V freezer on the port side of the galley which also has the practical luxury of top and bottom drawers. The stove is a Force 10 propane three burner with oven and solenoid shut off that was installed in 2009. Above the stove you will find a GE Spacemaker II microwave. There is abundant storage for cutlery, plate racks, spice racks etc. 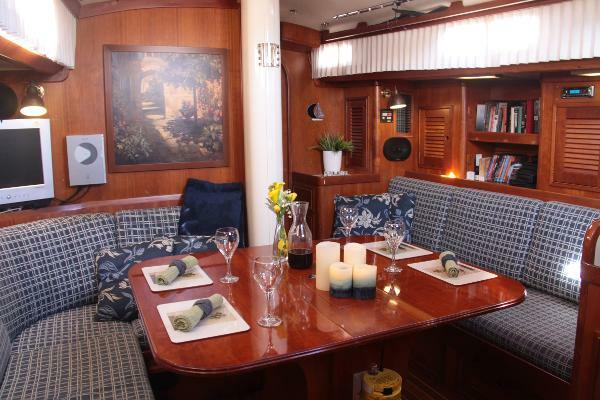 The galley is well organized, for a quick meal at sea or a feast for five at anchor. 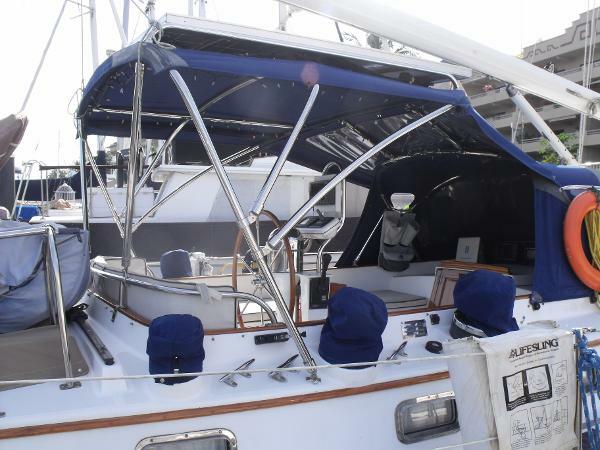 Stepping down the companionway you are greeted with an abundance of natural light from the screened opening ports and overhead hatches. 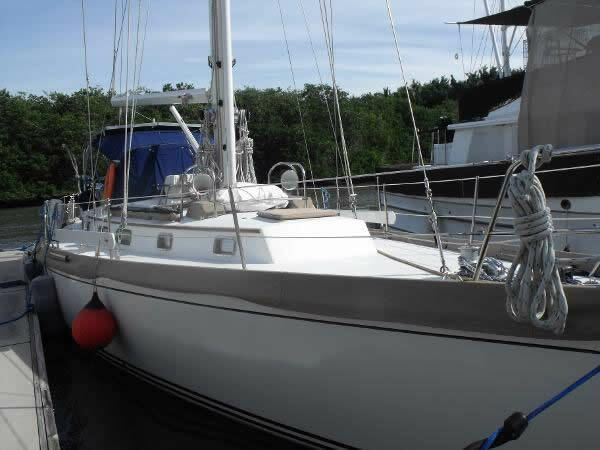 To the right and just behind the companionway is a well thought out galley that combines space and security for the cook. Stepping forward from the main salon you will find the guest head to port and lockers to starboard. 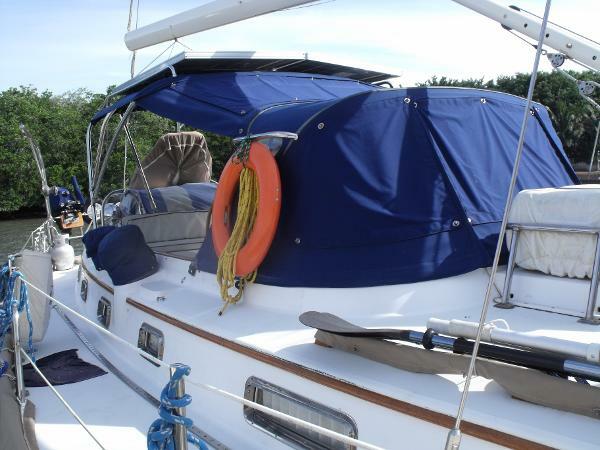 The guest cabin V-berth is generously sized and will comfortably sleep two six foot plus sailors. 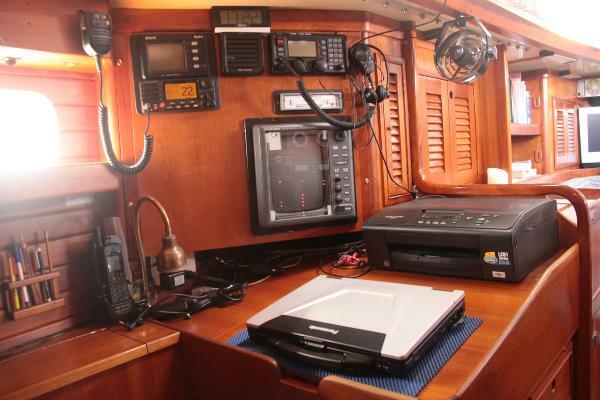 On the port side heading aft from the main salon is the full size nav station with a lift up desk for charts. On the wall of the passage way aft is the electrical control panel. 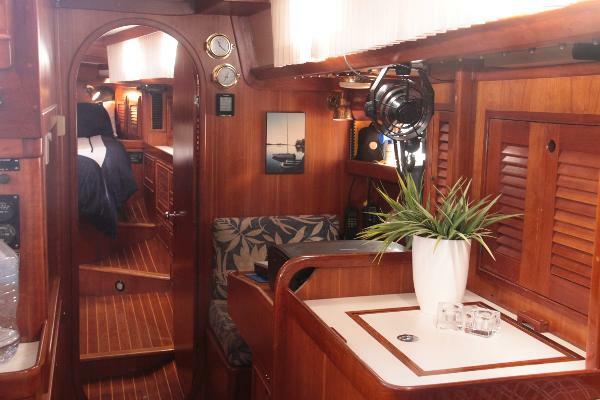 Beyond that teak doors in the companionway open to reveal the well lit and recently re-soundproofed engine room which also contains the Onan 8 kw generator. There is excellent access to the engine, generator and Aqua drive transmission. 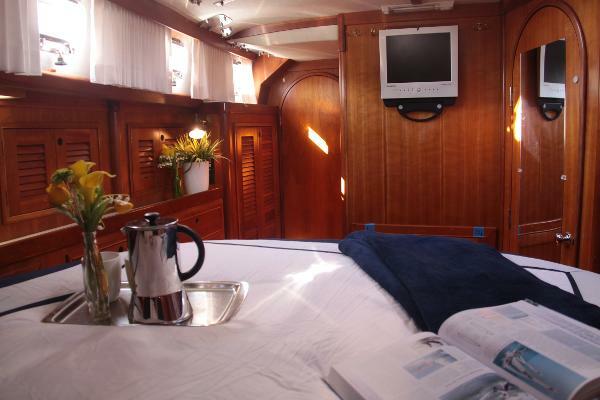 Continuing aft is the owner's stateroom with a queen size centerline bed with walk around access. There are opening brass ports and two hatches in this opulent cabin for lots of light. There is another flat screen television on the rear bulkhead along with dedicated fans. Once again there is ample storage and drawer space throughout. Moving forward from the owner's cabin is the master head with a stand alone full size shower as well as vanity. The size of the shower permits the use of a stand alone hand cranked washing machine as well as a mounted laundry wringer. Sound isolation from the master cabin to the salon is excellent and there is ample headroom throughout the boat. This boat has well engineered and installed safety systems. There is a Zodiac 6 person life raft, a well supplied ditch bag, life sling and Satfind 406 EPIRB. There is also a new Satellite phone, new SSB with pastor modem and AIS with both receive and transmit and the mast mounted fog-horn and hailer has automatic hailing. The MOB Lifesling has been thought through and modified into a system that permits single handed retrieval of a large swimmer by a single person of smaller size. The Lifesling is integrated with the outboard/dingy lifting crane so the rescuer can use the 9090800 winch to retrieve the victim. The rear lifeline gates open for easy retrieval and there is a permanently mounted man over board ladder.